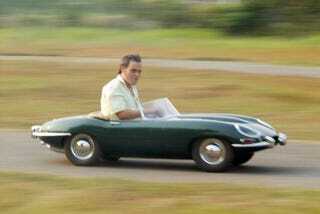 The manufacturer calls these beautiful half-scale sports cars—from the Porsche 356 to the Jaguar above—"children's cars." Whatever. They fit an adult perfectly fine, and I'm getting one to drive straight from my bedroom to my office desk. The cars, which are manufactured with exquisite detail, include the classic Porsche 356, the Mercedes Benz 300SL, the Jaguar E-type, the Willys Jeep, and the Bugatti T35. They use composite chassis and composite body shells, and can be driven by anyone age of 6 and up. In fact, the two seat models can fit a kid and an adult. They come with 50cc engines, but you can customize them with any racing kart engine you want, as well as choosing automatic or manual transmission.